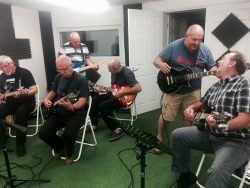 Our Rock and Blues Guitar Group is focused on learning a wide range of songs and performing together as a group! 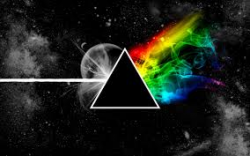 Eric Clapton, Elvis, Guns ‘n’ Roses, Pink Floyd, The Who, Pink Floyd and much much more …. Contact us for a taster! This fun group meets twice a month for an hours rehearsal, and works more like a band than a class. We learn new songs that stretch the members a little, but focus on rehearsing to performance standard, and going out and playing gigs as often as we can. You choose the songs, we teach you how to play them. Options of open chords, barre chords or lead parts are taught, and you can choose which part you want to play. Much like being in a band, this group meets to rehearse together, as well as learn, and has already performed together at various public events. To get the most out of this group, we recommend you are able to strum open chords confidently before joining. If you are not yet confident with open chords, please check out Strum 101 or personal coaching– after a few sessions of this you will be able to join Rock and Blues. 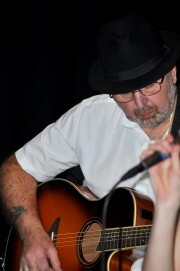 Group members can play electric or acoustic guitar. If you play electric, you will need to bring your own practice amp. Many players who have come through this group have gone on to perform at Igloo events, join the Band Coaching program and play in live bands. You can join at any time, and stay as long as you wish.